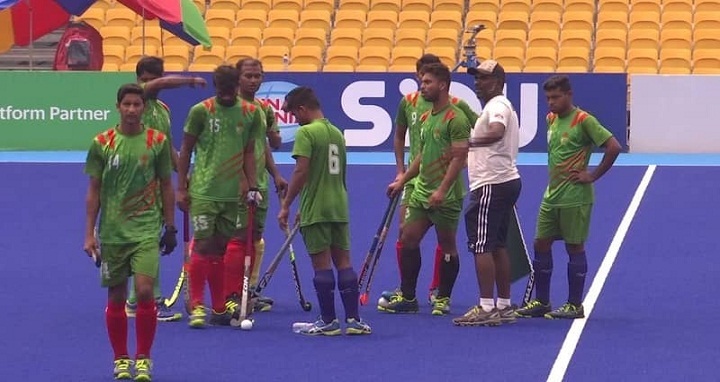 Dhaka, 27 August, Abnews: Ashraful Islam Rana scored a brace as Bangladesh national hockey team posted a 3-1 win over Thailand 3-1 in their fourth Pool B match at GBK Hockey Field held on Sunday in Jakarta. After the barren first half, in the third drag-flick specialist Ashraful successfully converting their first two penalty-corners before Milon Hossain added another in the last quarter to seal the Bangladesh’s victory. If Oman loses their game against Malaysia, a top six finish for Bangladesh will be all but guaranteed. As a result, they can directly qualify for the Asia Cup and the Asian Games in 2022 as well. Bangladesh will conclude their group taking on Pakistan on Tuesday (August 28) where a win would take them to the semifinal. Rasel Mahmud Jimmy earned the first penalty-corner for Bangladesh in the five minutes into the third quarter from which Ashraful opened an account for his side with powerful hit and he doubled the lead for his team six minutes later from another penalty-corner. Thailand tried to come back to the game in the final quarter and they pulled one back in the 48th minute while Milon sealed the victory for Bangladesh in the 55th minute.